For four lunchtimes, the majority of year 3 children worked with Mrs Granby and Miss Jeffreys to create two scarecrows; Henry VIII and the young Edward Francis! Their bodies were made by stuffing plastic carrier bags with shredded paper while their arms and legs were made by stuffing tights with straw. Their heads were pillow cases stuffed with straw. They were made to enter a competition at the Holy Trinity Church in Rayleigh who were having a flower festival to raise money for their tower. On the day, we attached the scarecrows to wooden frames and pots were put by them for visitors to vote for their favourite by putting spare pennies in. 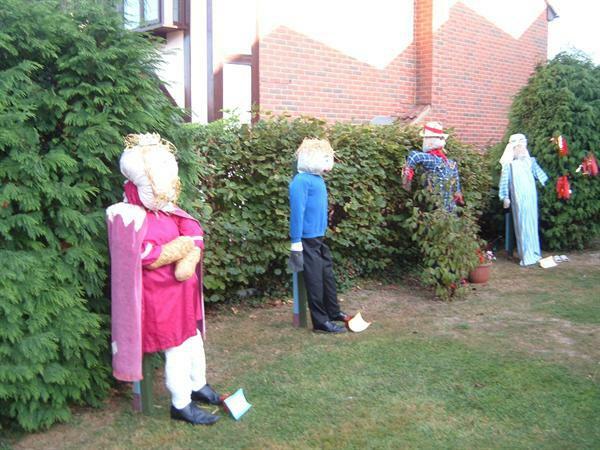 Our scarecrows came second and third. Henry raised £10.96 and Edward raised £10.93, so well done to all the year 3's.